Whilst doing my usual trawl through the wonders of the web I stopped off at Other Music in New York and spotted this. Couldn't find anything about the label just a few bloggers that had already leaked it. Looks like a straight bootleg but interesting none the less. This not an Afro Beat or Afro Rock compilation, the music on this record is strictly 60's garage! You probably always thought such countries, except South Africa, had nothing to contribute the 60's garage scene.....but seems our little world still has virgin places for the obscure garage 45s diggers before going to Mars!!! Here you have a surprising compilation of very, very rare tracks taken from 45s released in Congo, Angola, Mozambique and South Africa. 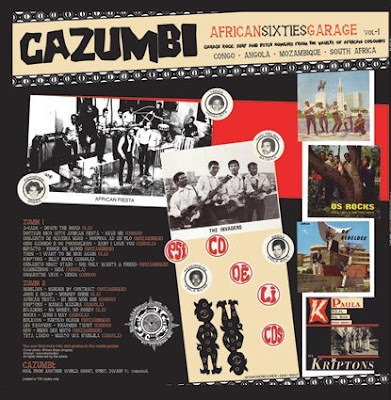 Garage rock, garage surf, powerful 60's R&B... an amazing collection with groups such as H20 (Mozambique) who had even carton boxes among their instruments, a rare track by the A-Cads, the incredibly rare Kriptons from Angola, an Italian sung (!!!) great cover of the Prunes' "I had too much to dream" by Conjunto Oliveira Muge in Mozambique, the eerie French sung "Eh bien mon ami" by African Fiesta. 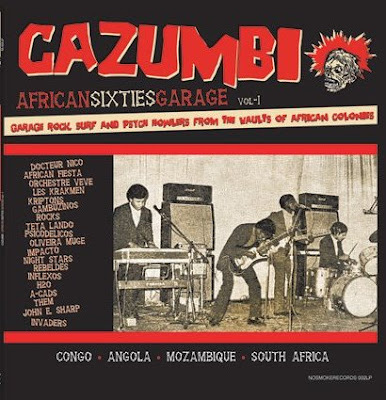 I'm not so sure about the rareness of some of these tracks (which I used for the African Rock and Roll 1&2 on African Serenades) but check it out. "I want to be rich again"
Can you appoint me in the direction of the link? I am not providing a link but if you do a google search using hte title and ".rar" or "rapidshare" I am sure you can find a link. Apologies about that but thank you for opening up a whole load of new music in the last while. Your blog is just fabulous.